Be warned. We’re going to talk about two pretty gross things – poo and innards – so ifyou’re eating something, maybe put it down for a bit. Ok? Cool. As anyone who has ever suffered from a bout of constipation will surely testify, the experience really isn’t all that pleasant. However, no matter how badly you’ve been blocked up in the past, you can pretty much guarantee that this guy had it worse. 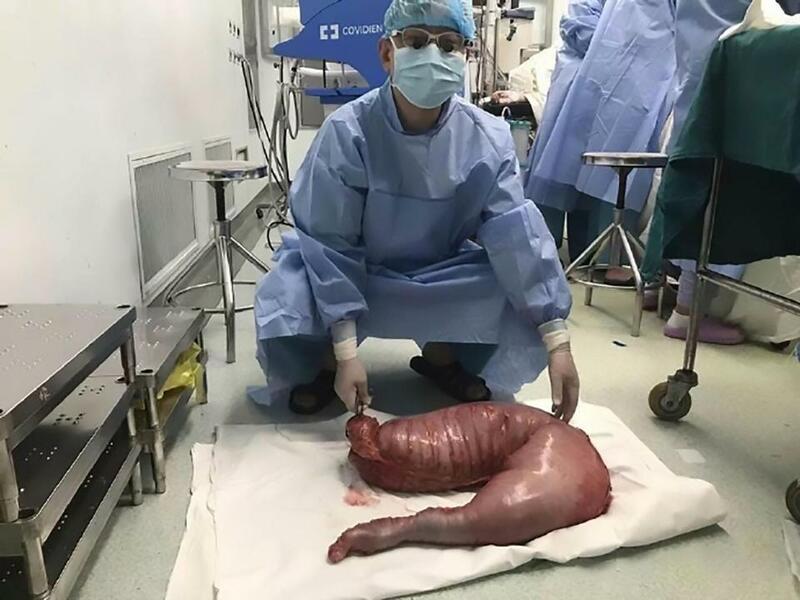 Surgeons in China have performed a highly uncommon procedure in order to remove 30 inches of a man’s large intestines after a rare condition caused severe constipation to keep building up over a period of several years. The 22-year-old patient, who remains unnamed, is thought to have been born with a rare condition known as Hirschsprung’s disease. The highly unfortunate condition is caused by missing nerves, which would ordinarily help to squeeze and relax the bowel while passing… erm… turds. As a result, all that nasty stuff can become backed up and stuck in sufferers’ guts, leading to some pretty horrific complications. Doctors say the patient in question, treated at the 10th People’s Hospital of Shanghai in eastern China, first developed evident symptoms at a very young age – in fact, his belly swelled up so much that he looked as though he was heavily pregnant. For a considerable amount of time the man relied on laxatives and other constipation medicines to force his bowel movements, but now a team of experts, led by Dr Yin Lu, have operated to relieve his pain. Dr Lu was taken aback by the size of his patient’s abdomen, adding it “looked like [it] could explode at any time.” I’ve never really thought of my abdomen as something that could explode – looks like I can add a new entry to my list of neuroses. The man was reportedly in so much pain due to his bizarre condition that he finally plucked up the courage to go and seek out professional medical help. After being examined, tests quickly confirmed the young man had astonishing amounts of faeces trapped in a section of his colon (this potential explosion’s just sounding worse and worse, by the way). He was taken into the operating theatre and underwent a three-hour procedure to have 30 inches of his intestines removed before surgeons stitched it closed at either end. You can imagine why. Following the operation, surgeons took the opportunity to put the bloated chunk of gut onto the scales and found it to weigh a colossal two stone. The disease is typically diagnosed in babies and children and causes severe constipation that can lead to a dangerous bowel infection, called enterocolitis if it’s not treated early on. There’s a happy ending in this case, though. According to Dr Lu, the patient is stable, following surgery, and should make a full recovery. 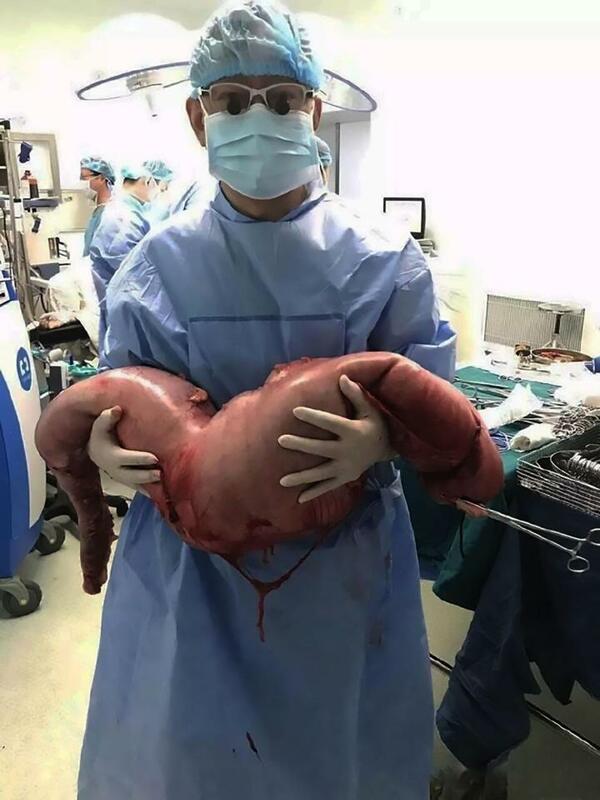 0 Response to "Surgeons In China Remove 30 Inches Of Constipated Man’s Intestines"